As I learnt recently when interviewing Sydney singer/songwriter Wes Carr about his new musical endeavour, when Native American Indians used to dream of a Buffalo, it meant that they would return to their heritage and back to their roots again Well after winning Australia Idol back in 2009, the years that have followed since have been about Wes Carr discovering his true calling, both in a personal and specifically, musical sense. On the incredibly raw and honest EP that is Blood & Bone, Wes takes us on a musical and lyrical journey through this discovery. The simple acoustic guitar and slight hint of percussion provides the backdrop to the inspiring vocal melodies of the confessional title track Blood & Bone, a track that Carr wrote whilst in Nashville. Lost features a co-write with the great Australian songwriter Don Walker and with vocal contribution of Elana Stone, it’s a song that relies on vocals and melody, rather than instrumentation, the highlight of the EP for me. Eighty Eight has more than a hint of Neil Young rawness, and if this track was a color, it would be brown, brown like the harsh, desolate Australian wastelands that this track evokes images of. Cradle Of The Universe finishes off the EP in somewhat of a haunting style. For those that were familiar with Wes Carr in his past guise, you will find very little on here reminiscent of the past and that’s the key thing. 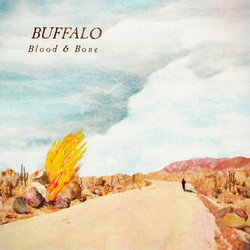 That was Wes Carr and this is Buffalo Tales, an EP that needs to be digested and enjoyed on its merits as the musical statement that is Buffalo Tales. A statement made by a highly talented vocalist, musician and above all, songwriter who will hopefully now flourish wearing some far more comfortable “shoes”.